Oh how he loves us. I feel His love every day, and I am so grateful for that. He simply asks us to continue in His love. Continue in His love is the very least we can do. We should love wherever we are. Smile and be cheerful. It is amazing how people respond to that kind of love. It is almost as if they aren’t expecting kindness. We should always try to be like Jesus. He is the best example we could ever have of love. This brings me to another area of love. Love of our mate, and showing it. My wonderful husband of 46 years has always shown me so much love. I am very blessed that the Lord brought us together. He has always brought me flowers. Spoiled me a lot, and even now that he is too sick to go out and buy me flowers he will tell me to go buy myself some flowers. The ones in the above photo are some of those. 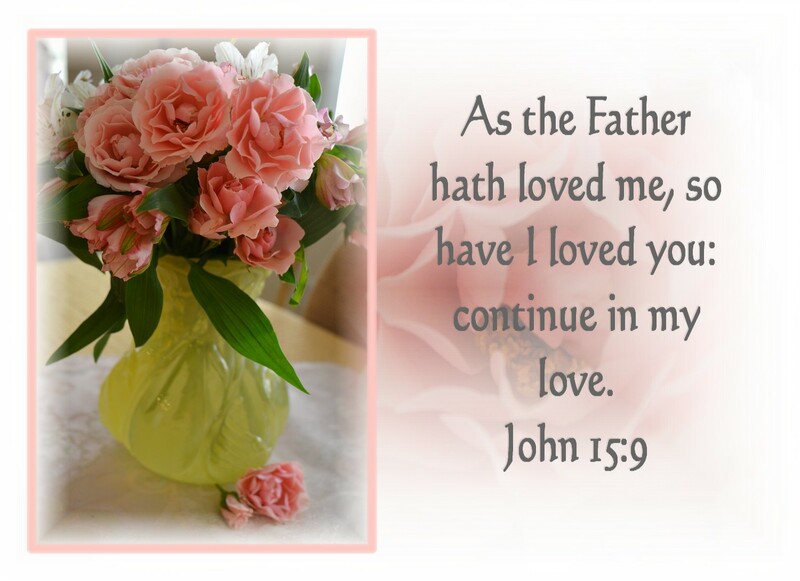 He continues in that love everyday of our life. Lets all continue in the Lords love at home and when we are out and about. It’s the only way to live. He can use that love in so many ways as we are obedient to continue in His LOVE. Gorgeous!!!! Just like you, mom. 🙂 Love you!